Get out the Oregon Road Atlas. From Ashland, OR drive about 8-miles east of town on Highway 66, pass Emigrant Lake and veer right on Buckhorn Springs Road, veer left on Tyler Creek Road, and head south on Baldy Creek Road. Follow Baldy Creek Road to a small parking area where the Pacific Crest Trail crosses it. 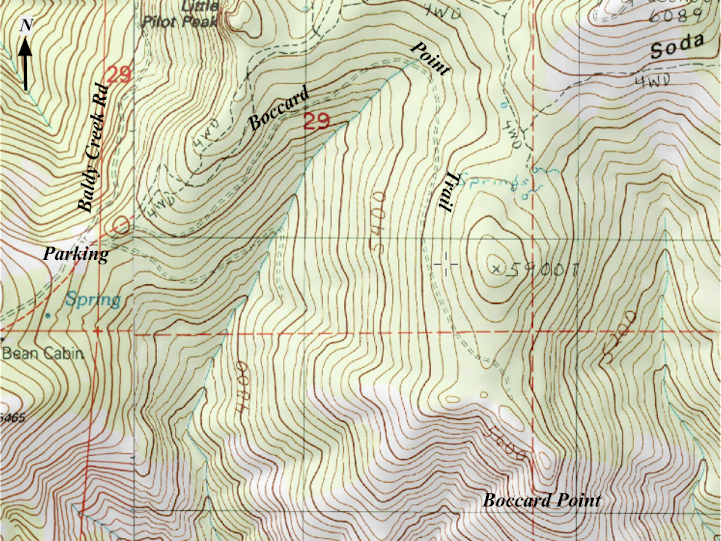 Pick up the USGS’ 1988 7.5″ Soda Mountain Quadrangle to navigate through this section of the Soda Mountain Wilderness Area. Boccard Point was included in the Soda Mountain Wilderness designation in spring 2009. Since then the road leading to this iconic destination was decommissioned, making it difficult to pass by foot. In 2014 our crews cut a primitive trail bench into the old road prism. Look for a faint path heading east. The primitive trail follows a decommissioned road for about 2.2-miles to Boccard Point, a unique outcrop with panoramic views.